OK, so we don't ride Harleys or Kawasakis or any other big motorcycles, but at one time we each did. Well, mine wasn't really so big. It was a Honda 50 which I had in Japan. I lived in Nishinomiya and had to climb a very huge hill/small mountain to get to my work, so the mission bought me this great motor bike to make the trip easier. 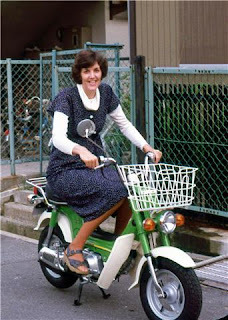 Most little Japanese mamas putted slowly from home to the market or to their kids' schools, but I drove my motorbike like someone late for work! A woman to be reckoned with was I. One beautiful, sunny January afternoon I decided to go for a bike ride. I drove and drove, soon losing track of the number of turns I'd taken, and ended up at a train station way up in the hills far from home. I followed the train tracks back to familiar surroundings, but by the time I got home the January sun had been down for a couple of hours and I was bitter cold. 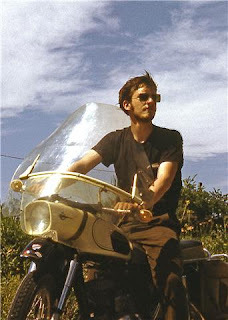 Tom had his motorcycle while he was a student in Europe during his junior year of college. He was studying Art History in Avignon, France, with a group from the University of Washington. One evening he and a young woman from his class were returning from a picnic (both on his bike), and the engine kept dying. The only way to avoid that was to drive with the headlight turned off. So they'd drive along in the dark for a while, turn the engine on again, and go as far as they could before it began to die again! Eventually it gave out completely. He had to push it to a repair shop in a nearby town and walk back home. A simple coil would have been enough to fix the problem, but they had to order one from Germany and never got around to it. So he left it with the repair shop to sell it for him and he bought a cute little Citroen Deux Chevaux to travel Europe with his friend Ron. The new car fondly reminded him of Mickey, Donald and Goofy's cartoon car, sort of a motorized garbage can. So much for the motorcycle! Here are some words of encouragement for you today: It is God which worketh in you both to will and to do of His good pleasure (Philippians 2:13, KJV). I have loved this verse since I was young, especially how it reads in the King James Version -- this reassurance that God Himself is the one who helps me will (want) to do what pleases Him and then helps me actually do it. On my own, I can't do the things that God desires. There are times that I can't even want to do them on my own. But God, by His presence in my life through Jesus, can work in me on both counts. So if you, like me, are facing a situation today in which you or someone you care about struggles to do God's will or even to desire God's will, take it to Jesus. Remind Him that He has declared this truth in His Word, and you are depending on Him to be faithful to His Word today. Ask Him to help you desire to do His will and give you the strength to do it, then watch Him work. That's what I plan to do. If we ever have a fire, the first thing I will grab to take with me is my Bible. The delicate leather cover of my Bible wore out years ago, so I found an ad for a company in Idaho that recovers Bibles and now my beloved Bible is swathed in the sturdy brown hide of some rugged animal, giving it a rather austere appearance. But you can bet it will never wear out. Once in a while I read the Bible for the comments I've penned in it. 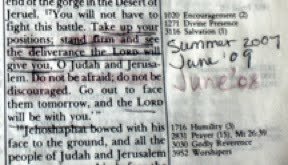 Occasionally passages are dated, acting as a kind of spiritual journal for me, such as 2 Chronicles 20, which has encouraged me through the past three summers. Written beside Micah 8 I have a quote attributed to Dr. C. Door Demaray, the former president of Seattle Pacific College. He said, A person isn't humble until he expresses a need. Whether this was my own insight or someone else's I don't know, but in Mark, chapter 8, where we read about Jesus feeding the four thousand, I have written, The disciples had all they needed to feed the crowd -- they had 7 loaves and they had Jesus. 3. Trouble should not be wasted. There it is, written in my Bible, a reminder of how the words of Scripture apply to life in the 21st century. We were in the University District of Seattle the other day, looking for someplace to eat. Tom parked the car on the corner of NE 42nd and Brooklyn, rather out of the main business district. We intended to round the corner to a nearby Thai restaurant, but took a chance on the Saigon Deli, a Vietnamese restaurant, instead. Oh, my, was it ever delicious! I had a bowl of noodles, spelled Pho but pronounced Fah. It was loaded with rice noodles, vegetables, large pieces of chicken, savory basil, bean spouts, jalapeno pepper and lime. Hot, healthy, and very satisfying! Tom's Bun was a noodle, vegetable and pork dish seasoned with fresh herbs. We were quite happy with our meal and would have been fine to pay the bill and go home, but after we finished the server brought us our free dessert, a cup of homemade yogurt. "We make it fresh everyday," she told us. I've got to tell you, it beats any other yogurt I've ever had, so smooth and sweet without any sharpness to it at all. We liked it so much that we bought several extra cups to bring home with us. It was not thick like commercial yogurt as it had no gelatin in it. Consequently, it does not hold up as well; within a couple of days it had turned to sweet milk. For several days I basked in the memory of that meal. I was wondering when we might get some more Vietnamese food when I pulled up to a stop sign in the middle of my own little town, Stanwood. Glancing to my left I realized that Yummy Noodles and Grill, which I pass several times a week and which has been in the same location for two or three years, is an authentic Vietnamese restaurant! So guess where we had lunch on Saturday. Yummy Noodles! The food was just as tasty as what we ate at the Saigon Deli. The small restaurant was brightly decorated in yellow and red, and smiling at us from the walls were the photos of dozens of happy customers who had already enjoyed the place. 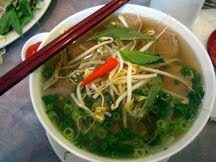 I'm starting to think we're the last people in the country to have discovered Vietnamese food! For years a missionary in Zaire (now Democratic Republic of Congo), Helen Roseveare shares a story of a child's prayer and God's provision for two small sisters. God has ways to make Jesus known to those who want to meet him. Charles Morris of Haven Today has been encouraging his listeners to read through the Bible. He has been promoting a program called The Bible in 90 Days and has featured the director of that ministry and a woman who has gotten many people to join her as she has read through the Bible. I've got to say, he's piqued my interest. This is not an intensive Bible study, or even a Bible study at all. it is designed to give folks an overview of the scripture, a sense of God's work in the world as revealed in the Bible. It can be an enriching experience, maybe even a life-changing experience. It's a simple program. At their website, The Bible in 90 Days, you'll find a bookmark you can download with each day's reading. They also have a large print NIV Bible available, with the daily readings marked off every 12 pages. Included on their site are links to the audio Bible read by Max McLean so, if you like, you can even listen along as you read. That's all there is to it. The only time I systematically read through the Bible in a year, it took me 18 months. Maybe you have had a similar experience. So how could I possibly do it in 90 days? I'm thinking about finding out. If I do, would you like to join me? I've just started reading the New Testament. They say that you can do it in just 21 days. I'll let you know how it goes and whether or not I am ready to commit to the whole Bible. We saw chef Curtis Stone from KitchenDaily demonstrating this recipe on the internet the other day so last night we tried it ourselves. It was delicious, healthy and very satisfying. You'll want all your ingredients ready before you begin. It should only take about 15 minutes to cook. Prepare the orange sauce by squeezing 1 cup of fresh orange juice. Cut both ends of the extra orange off, then remove all the peel and pith (white stuff that's under the peel). Take a small sharp knife and cut the segments away from the membrane to use for garnish. Pour the juice in a sauce pan and boil it down while the broccolini and salmon cook so that it reduces to about half. Sprinkle salt and pepper on the broccolini, drizzle a little olive oil over it, then grill it on a hot griddle. It will be slightly charred when finished. While the broccolini is cooking, sprinkle some salt and dill weed on both sides of the fish and cook in olive oil in a hot pan. Cook on both sides. The salmon should be golden on the outside and still slightly pink on the inside. 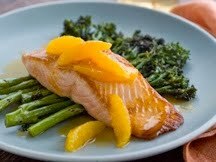 To serve, place some of the grilled broccolini in the center of a plate, place a piece of grilled salmon on it, top with a few orange segments, spoon sauce over the salmon and drizzle some around the outside of the plate. In Bangladesh, you can pick up your cell phone and dial 3-0-0-0 for a three-minute English lesson. The call costs just five cents. Launched in November, 2009, Janala (which means "window") is the brainchild of the World Service Trust, the charity arm of the BBC. Speaking English is considered the passport to a better life, a way to open up jobs in the textile market and in service industries such as banking. With Janala, after eighteen months of making a three-minute call a day, five days a week, the students will have learned conversation, pronunciation and basic English grammar. The goal is to teach six million people by 2011. It sounds like they are well on their way. On launch day, 25,000 calls were expected; 80,000 calls were actually placed. There's an amazing program just a couple of miles from home, and there may be one close to your home as well. It's called WatchDOGS (Dads of Great Students), and is designed to provide additional male presence on school campuses. WatchDOGS was established by Jim Moore, a dad in Springdale, Arkansas, in response to the 1998 Jonesboro school shootings. He was concerned about the safety of his kids and realized that men could make a difference on school campuses. "Somebody who's not there, who could be there, is me," Moore said. "And I thought, 'Well, what if you could create a program for fathers, and father figures, that come to school just to be that extra set of eyes and ears for the students and for the teachers?'" WatchDogs is now in 38 states and New Zealand and has over 1,559 chapters. Cedarhome Elementary in Stanwood is one of them. Tim Poetzl is a WatchDOG. He and Cedarhome's principal, Jeff Lofgren, star in this rap about every day life at school. Historical friends. That's what my brother calls those people you have known and loved for a very long time. 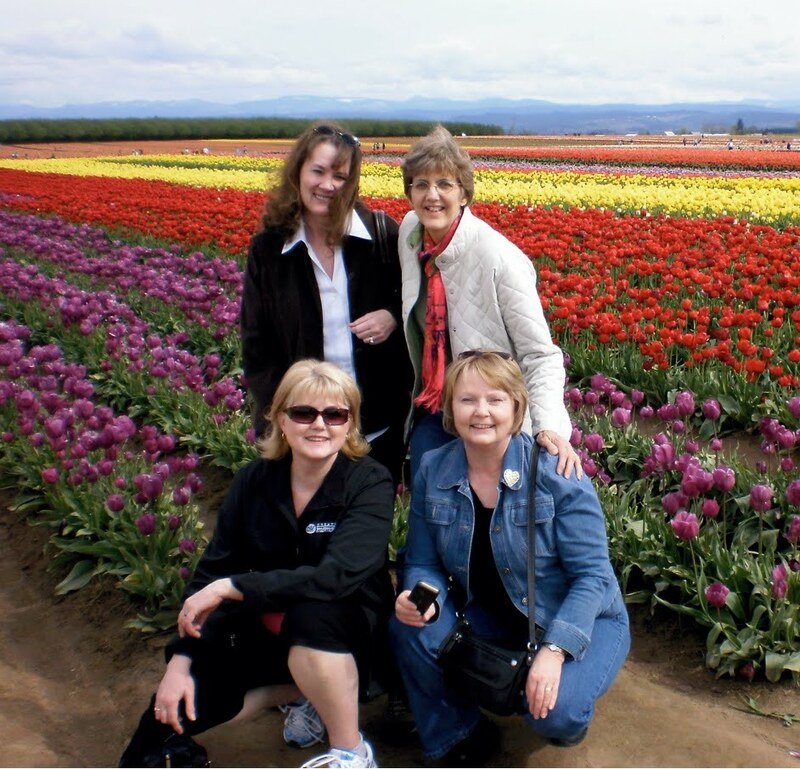 I spent the weekend with some of my historical friends -- Terri, Judi and Nancy -- friends since our late teens. 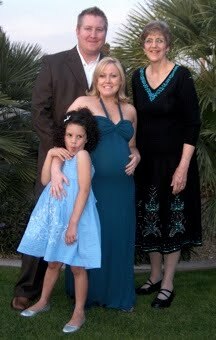 It was the first time since college that all four of us had been together at one time. Since we are all turning 60 this year, we thought it was about time. We laughed and cried together, ate in and ate out, poured over photo albums, played the piano and sang -- in three parts, mind you! -- and shopped. 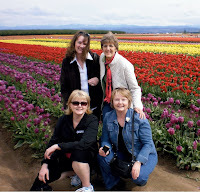 We also spent a couple of hours at the Wooden Shoe Tulip Festival in Woodburn, Oregon. 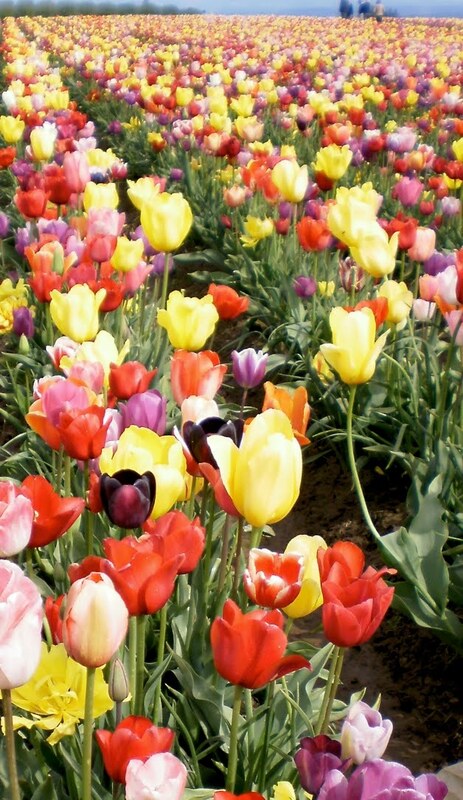 The flowers were arranged in rows by color, as they are in the picture above and which I have often seen, but there were also large sections where the colors were mixed. All in all, the fields were spectacular! On the heels of my trip to Arizona with my parents and siblings, I was a little uncomfortable about leaving my family for the weekend. Tom was great and told me to go and have a good time. Still, I went away with a slight twinge of concern. But when I checked my e-mail I found an e-card he'd sent us. Two animated old gals in their bangles and do-dahs, big hair and bright lips, were wishing us a happy birthday and reminding us that no matter how old we get, we'll still be "major babes"! Good friends and a great husband. What more could I ask for? Q: If "April showers bring May flowers,"
what do May flowers bring? When the Haiti earthquake struck, Katie Zook was on the fourth floor. Realizing that the doorway she was standing in was not reinforced, she found a pedestal table to crawl under and assumed the "duck and cover" position. When she was rescued three hours later she was in the basement, still under the table, with rubble all around her. A collapsed lung and other injuries made it impossible for her to call out, but she found an empty handiwipes container and banged it on the table so that she could be found. After weeks in hospitals in Guantanamo and Florida, she is now back home in Arlington, Washington, recovering. As a teenager, Katie fell in love with Haiti and returned to minister there a year ago, after she finished college. She taught English, helped arrange for a huge conference that had just finished earlier in January, and assisted in any other way she could. She especially enjoyed getting into the community, coming to know the culture, and loving the people of Haiti and the people with whom she served. Her beloved supervisor, Pastor Jeanne Munos, also took cover in a doorway on the fourth floor when the ground began to shake. Katie's last glimpse of Jeanne was of her shoes, the very pair Jeanne had recently loaned her to wear to a friend's wedding. Before the earthquake Katie had just finished reading the book of Job, seeing similarities between Job's suffering and those of the Haitian people. Job 38 ad 39 have come to have special meaning to her as the Lord challenges Job. "Who is this that darkens my counsel with words without knowledge?... Where were you when I laid the earth's foundation? Tell me, if you understand..."
Like Job, Katie has come to know for certain that God is in charge, even in the midst of suffering. Although she is anxious to return to Haiti, she says, "God is in charge, and I am not and never will be. God knows what Haiti needs and who can help meet those needs." "God is using this terrible event for His glory," Katie says. "He is doing amazing things in Haiti. He does not need us to do His work," and then she smiles, "but He chooses us to help. I've bee spared to give back." Tom's Gramma Irma, whom I never met, was a woman way ahead of her time. Born at the end of the 1800s, she visited the chiropractor and was into "health food" before most of the world knew a thing about it. It must have been in her reading of Prevention Magazine that she learned of the "Grape Cure," flushing out her system periodically by a diet of grapes. She had owned a diner before she met Grampa and was a fabulous cook. 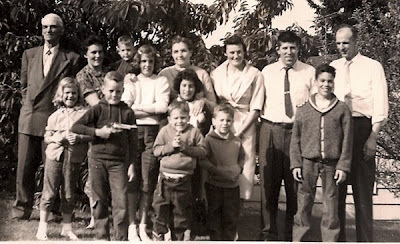 Tom's sister Marilee described Tom and his brother Danny chasing the chicken around the yard till it finally fell down, Grampa butchering it, and Marilee helping Gramma clean it so that she could make her mouth-watering chicken and biscuits. It made me wish I'd been there. Marilee recalls an experience when she was about 10 years old. She was staying with her grandparents and Gramma Irma prepared a glass of carrot juice for her in this juicer. The stuff was so distressing that she couldn't drink it until Gramma Irma added some pineapple juice. 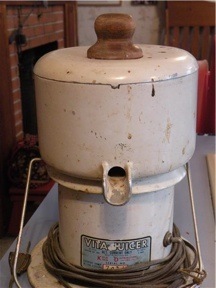 We make carrot juice too, but ours also includes an apple and a peeled orange and apple juice. We bought a VitaMix a few years ago and have had a lot of apple/orange/carrot juice, but in the last few months we have given it a workout making vegetable drinks. The funny thing is, it was Samuel, the boy who considers the foundation of the food pyramid to be catsup and avoids all vegetables except pumpkin, potatoes, and tomatoes and lettuce (on a sandwich but not in a salad), who got us into them! One day our chiropractor told Samuel that he needed to get more vegetables and recommended veggie drinks. He listed the things they put into the VitaMix at their house and how tasty and healthy the drinks are. So Samuel asked if we'd make one. His eyes blinked a little fast and his mouth scrunched up a bit, but he pronounced it "Great!" and has never turned down one of our concoctions. We put the juice in first then add the kale and the other veggies and the apple and, finally, the ice. It's a great way to get your greens and a wonderful start to the day. oh, that will be glory! now that's a different story! These days I am remembering that God's people are just that -- people. If we are followers of Christ, we are growing into His likeness (2 Corinthians 3:18) and when we see Him face to face we will be complete. But until that day comes, we live in these mortal bodies with our unique personalities, our gifts and talents not yet fully understood or developed, and many rough edges (possibly even a few sharp edges). The most sincere among us, the one most desiring godliness, still has a long way to go to be all God designed him or her to be. We are lopsided, with inadequacies and areas of arrested development, not fully understanding our own issues, much less those of the other guy. This calls for great patience on the part of all of us. But this is our life, and we have God's grace to help us through. The really good part is that in Heaven we will finally be all that God intended for us to be. No more frailties; no more glaring flaws we didn't even know we had. Where one person has mistaken his gift of leadership for bossiness, he will be the leader God designed him to be. For the one who fell short of her potential because of some unresolved fear, she will shine! I am so looking forward to seeing who I really am when I am in God's very presence. ButI equally await seeing all the "saints below" as the people God made them to be. I look forward to getting to know them in their fullness, just as God sees them through Christ. That will be glory. From the moment she gave the invitation, I knew my life was about to change. I was having lunch with my friend Carol, a gal I'd met at youth camp one summer and had recently re-connected with. We'd been meeting for lunch occasionally over the past couple of years, usually at the Honey Bear Bakery in Seattle's Green Lake neighborhood. We'd chat about our lives, our families, our interests. Sometimes she'd talk about her brother Tom, and I'd talk about my brother Tom. But this day was different. "My brother Tom and I would like you to come to dinner," she said. (Yikes! Whatever happened to "my brother Tom"? Now he's "my brother Tom"!) I took a quick breath. Yes, I would join them for dinner at their house on Monday the 11th of April. That turned out to be a crazy day, which included my helping with a lunch for folks in international student ministries, visiting my cousin in the hospital, getting a parking ticket, and being rear-ended on my way to dinner. By the time I arrived I was past worrying about first impressions. I was just glad to sit down and rest. Over dinner I learned that Tom and I had been in college together -- 18 years earlier -- but had never met. His house was full of his paintings, pottery, and woodworking. He was a gracious and kind host, his house was lovely, and he and Carol had prepared a delicious meal. I knew that whether or not he called again, I'd had a delightful evening. But he did call. He invited me to Ivar's Salmon House for lunch on Friday. Ivar's au gratin potatoes were so moist and delicious, he told me, that I was sure to love them. I found them dry and hard to swallow. The same for the Greek food he introduced me to on Saturday and the dinner he treated me to that evening. Still, we found much to talk about and laugh about. 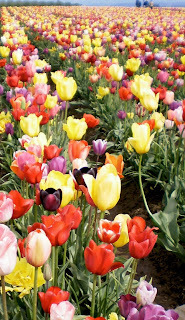 We went to see the tulips in LaConner the next Saturday, then went to Rosario Beach at Deception Pass for a picnic. It was cold and windy, even in the picnic shelter. I handed him a small vase and sent him off to find a bouquet for the table. "But there's nothing blooming yet!" he protested. "That doesn't matter," I told him. "You're an artist. Just find something pretty for our table while I get the lunch ready." We were sitting beside each other, facing the water, shivering in the wind, enjoying our picnic, when two twenty-something men appeared with push brooms. It must have been the first good sweep the place had had in a while because dirt started to fly and we began to cough. We asked what they were doing and they said, "Oh, we're just cleaning up. The youth group from our church is coming here later for a picnic!" Needless to say, in a matter of minutes they had the shelter all to themselves! 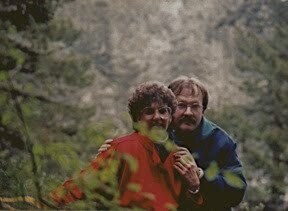 Tom set the camera on a ledge as we hiked around the park and clicked the timer, then joined me for the picture above. We've been clicking together ever since! The following information may not save your life. I can't vouch for its veracity, but it was sent to me by Floyd the File Clerk, and I know him to be a very smart guy. I urge you to memorize it. Used with discretion, it could just make you the life of the party! Many years ago in Scotland, a new game was invented. It was ruled 'Gentlemen Only...Ladies Forbidden'.. .and thus, the word GOLF entered into the English language. Every day more money is printed for Monopoly than the U.S. Treasury. Men can read smaller print than women can; women can hear better. The State with the highest percentage of people who walk to work: Alaska. The percentage of Africa that is wilderness: 28%. The percentage of North America that is wilderness: 38%. The cost of raising a medium-size dog to the age of eleven: $ 16,400. The average number of people airborne over the U.S. in any given hour: 61,000. Intelligent people have more zinc and copper in their hair. The first novel ever written on a typewriter, Tom Sawyer. The San Francisco Cable cars are the only mobile National Monuments. If a statue in the park of a person on a horse has both front legs in the air, the person died in battle. If the horse has one front leg in the air, the person died because of wounds received in battle. If the horse has all four legs on the ground, the person died of natural causes. Only two people signed the Declaration of Independence on July 4, John Hancock and Charles Thomson. Most of the rest signed on August 2, but the last signature wasn't added until 5 years later. Q. Half of all Americans live within 50 miles of what? Q. Most boat owners name their boats. What is the most popular boat name requested? Q. If you were to spell out numbers, how far would you have to go until you would find the letter 'A'? Q. What do bulletproof vests, fire escapes, windshield wipers and laser printers have in common? A. All were invented by women. Q. What is the only food that doesn't spoil? Q. Which day are there more collect calls than any other day of the year? At least 75% of people who read this will try to lick their elbow! Let's Hear it for the Library! It's Thursday afternoon, and I'm sitting in our local library. Our computer is at the shop so I am taking advantage of a couple of hours to access one of the many computers that is available to all patrons of the library. I didn't often go to the library as a kid -- it was downtown and, with five little kids and no driver's license, it was difficult for Mom to get us there. But did I ever love the Bookmobile! Twice a month we'd walk the couple of blocks to where it was parked in front of Taylor's grocery store, across from the fire station. That and the school library opened up the world to me. At junior high orientation we were given two forms to fill out to obtain our library cards. One was light blue and the other was peach. They looked beautiful together and I knew the moment I received mine what my wedding colors would be! Ah, how I loved the library! Over the years I used the library for research, for doing homework, for spying on boys. I got an occasional nap at the study carrol of the college library. My public library trips increased as my kids got interested in books and videos. I loved children's books so much that for my classroom volunteering I would offer to get books from the library to support whatever theme the teacher wanted. When the card catalog went online I was able to "go to the library" from our home computer. Tom listens to books on CD on his daily 40-minute commute to work, CDs he gets from the library. And that's where most of the DVDs come from that we enjoy watching. There is usually something on the library's holds shelf for at least one member of our family. Last summer, on our trip to Portland, we spent several hours in the city's public libraries and last week I made a mad dash into the Maricopa, Arizona library. They were all wonderful. My friend Karen is such a fan of the library that she entered an essay contest in Good Housekeeping about how the library has impacted her life -- and won! She and her homeschooled son Jonathan, along with her essay, appeared in the March issue! 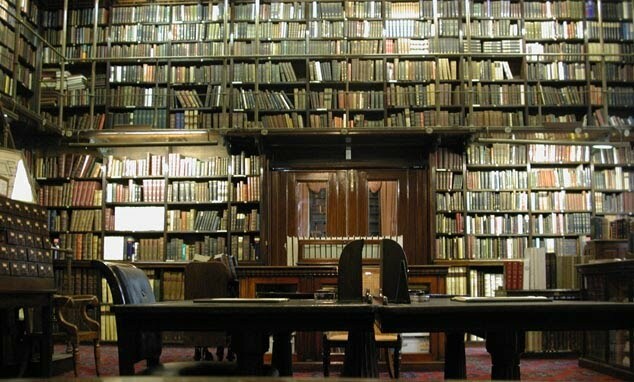 I can't imagine life without the library. When Tim was living in Boston he was impressed by the history all around him. Since our family has its roots in colonial America, he decided to go to the library to trace our ancestry. He was fascinated to learn that several of our forebears had been executed. He found a librarian and showed her his research. "Look," he said, "these relatives of mine died by execution!" "Well, actually they weren't executed," replied the librarian. "Their wills were." Last weekend we saw an extraordinary story of forgiveness in the movie, Amish Grace. In 2006 a man distraught over the death of his daughter nine years earlier entered an Amish schoolhouse and shot several young girls. Five died. This is the story of the response of the Amish community to the horror that they experienced. It is based on the book Amish Grace: How Forgiveness Transcends Tragedy by Donald B. Kraybill, Steven M. Nolt, and David Weaver-Zercher. The full movie is available online at the Lifetime Movie Network's website, here. It will be available online through April 28, 2010. Uncle Paul was married to Mom's sister, Betty. They married on his 21st birthday, the day before I was born. I most remember him for his role as a "Crosket" -- the name we called ourselves (the Crosses and the Foskets) because of our closeness. We were a family of eight kids and four parents who spent all the time we could together, camping, playing baseball, working, laughing, eating around an extended table. On a campout we kids would fall asleep in our tents to the laughter of our parents playing table games around the campfire. We all share so many sweet and happy memories from those times together. Charles Wesley, brother of the famous preacher of the 1700s, John Wesley, wrote over 5,500 hymns. You can find out about his life from this website. One of his songs, Christ the Lord is Risen Today, is our hymn of the month. Find the words and music here. I was going through some old recipes the other night and came across a recipe in my Mom's handwriting titled "Fosket's Oatmeal Cake". The funny thing about this is I've been making an oatmeal cake out of one of my cookbooks called "Lazy, Daisy Oatmeal Cake" --- I've only been making it about a year. Everyone really likes it, it's nice and moist and is one of those cakes that you have all the ingredients in your pantry already. It's the same recipe!! Little did I know I must have had this cake as a child on Berkshire --- the recipe has food stains on it and looks like my Mom must have made the cake. I'd like to bring it April 1 to Sheryl's, along with my Mom's written recipe. Is it OK with you? I know you are supposed to bring a dessert --- want to bring a salad and I bring the dessert? How could I pass up such an offer? 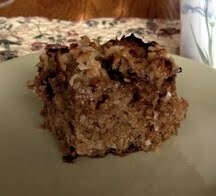 I hadn't eaten Mom's oatmeal cake in years, and it would be fun to share with our childhood friends. 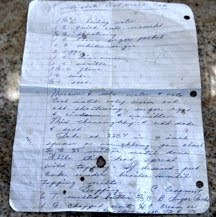 So here are a couple of photos from our lunch on April 1 -- the recipe, written in Roxi's mom's handwriting, complete with vanilla spills, and a piece of the cake. It was every bit as good as I remember, and no wonder, when I see the list of ingredients! I'm also writing out the recipe in case you'd like to try it yourself. Grease and flour 9x13 pan. Pour boiling water over oats and shortening or butter; let stand until shortening has melted. Add eggs, sugars salt soda, nutmeg, cinnamon, flour and vanilla. Mix until blended. Pour into prepared pan. Bake at 350 for 30 - 35 minutes. While baking, prepare topping: Combine butter, sugar and milk in sauce pan. Heat, stirring constantly, until sugar is dissolved. Remove from heat. Stir in vanilla, coconut and nuts. Spread over hot cake. I found a wonderful video for today, but I was unable to download it. It's Ray Boltz' song, "Watch the Lamb," illustrated by Eric J Jeon. You can see it here on YouTube. On my first day in Phoenix I met Jo. She is married to Seth's brother Steve, and they are expecting a baby girl in a couple of months. I asked if they had a name picked out for her and she said not yet, but they were taking suggestions. "How about Ginger?" I said. (I don't get too many opportunities like this, so I take advantage of any that come along.) "Oh, that's nice! I love ginger ale. We could call her Ginger Ale." Later I suggested that they give the baby a middle name that starts with the letter L, maybe Ginger Louise, so that they can call her Ginger L. If you say it fast it sounds like Ginger Ale. She laughed. I met Seth's dad at the rehearsal. When he heard my name he said, "My son and his wife are thinking about naming their baby Ginger." Then he called out to his son Steve and said, "Steve, this is Ginger!" Steve said, "We're going to name our baby Ginger." "Really? For sure?" "Ninety-five percent sure," he replied. The next time I saw Jo I asked her if they really did plan to use the name Ginger. "Absolutely! We think we'll use Layla for a middle name. Then she'll be Ginger L!" I like my name. But if I were ever to choose a different name for myself it would be Annie. When baby Ginger arrives she will be loved by her mommy Jo, her daddy, Steve, and her big sister Annie! I can't wait to meet her myself.